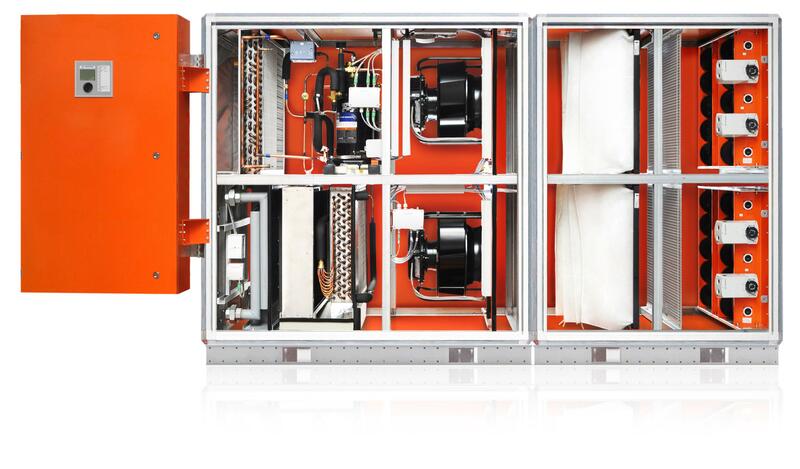 Units in the Frecolair 14 series were developed especially for discharging high internal heat loads into the atmosphere from buildings without humidity requirements. In data processing centres and technical facilities, these units ensure reliable operation and precisely regulate the supply air temperature absolutely spot on. The variability of the operating modes, in combination with first-class components and precise control and regulation systems, guarantees economical operation at all times. 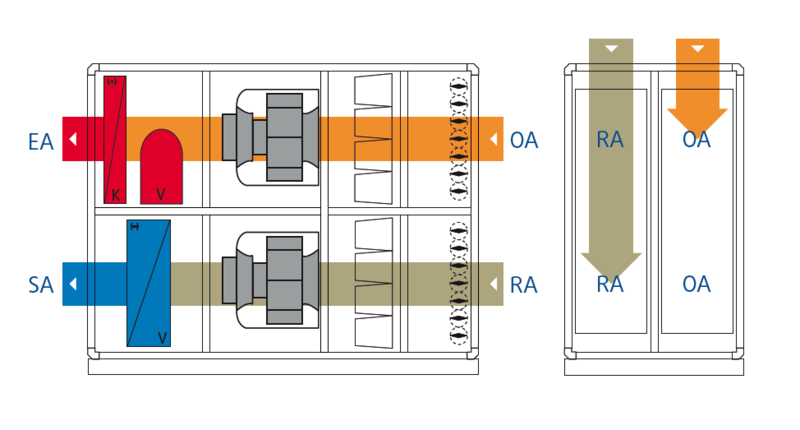 In order to avoid excessive drops in room temperature at low outside temperatures, a small proportion of the warm return air is added to the cold out-side air during partial recirculation mode. The proportion of outside air is variably controlled. 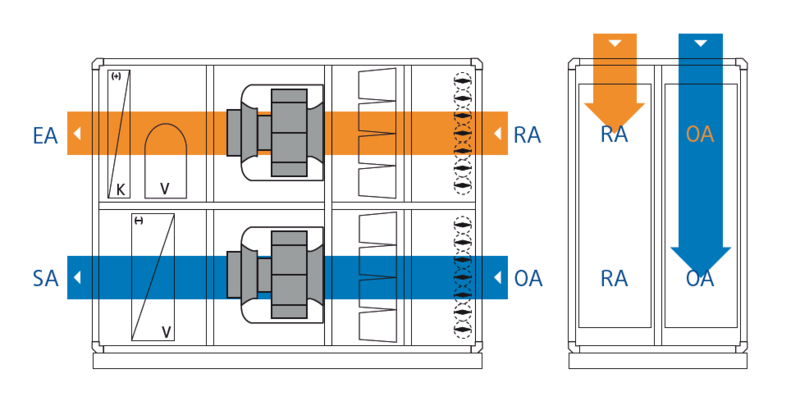 In free cooling mode, the inside heat load is discharged directly via the return air. The cooling takes place exclusively through the continuously controllable proportion of outside air. 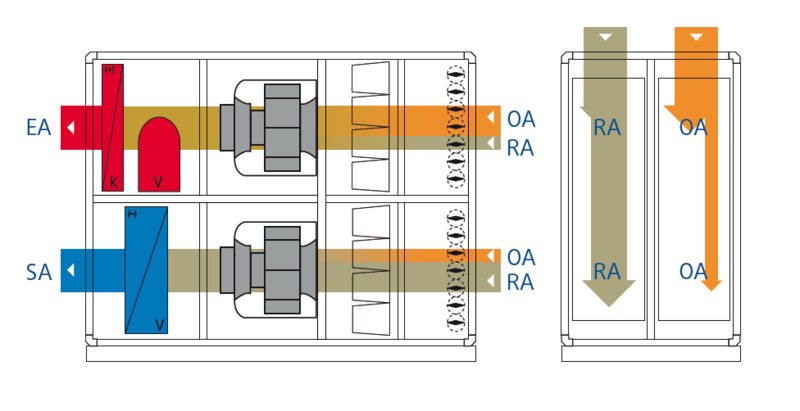 The internal heat load is discharged directly with the return air, while in part-load operation the compressor refrigeration system cools the warm outside air to the desired supply air temperature. 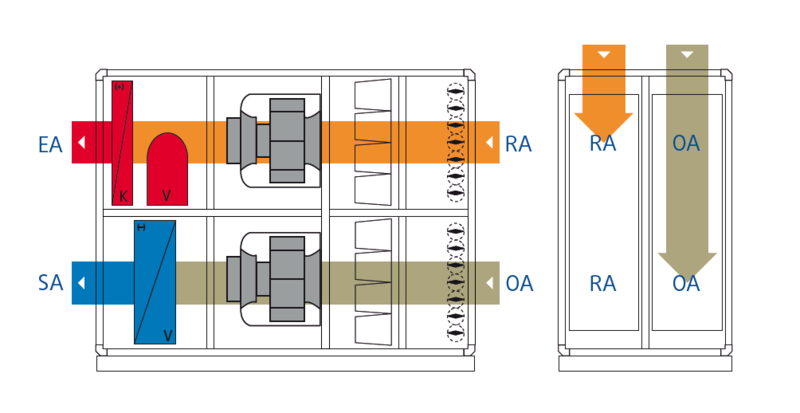 If the outside temperature exceeds the return air temperature, the system will automatically switch over into recirculation mode, which is more economical in that case. The return air is cooled to the desired supply air temperature directly by the output-regulated compressor refrigeration system. No addition of warm outside air is necessary. If the outside temperature is higher than the return air temperature and if a proportion of air from outside is required for hygiene reasons, some outside air can be added in a regulated and hence controlled manner during partial recirculation mode. The return air is cooled to the desired supply air temperature directly by the output-regulated compressor refrigeration system. Be among the first to find out about news and trends from the field of green buildings, energy solutions, air conditioning, ventilation and heating. Our newsletter is sent max. once per month per e-mail.